Big Rigs 'n Lil' Cookies: It's a Hot One Out There! It's funny how things impact you differently depending on where you are in life. Record breaking heat today is a little different for me today than it was ten years ago. It has more personal consequences and the reality of how it affects life is a little more real. Heat wave back in my "city days" used to mean getting to the river, to the mall, or just sitting back in the air conditioning. You would have to start watering your yard to keep up the pristine green of your grass. My pets were all tucked away indoors enjoying the air conditioning, without a care in the world. My concerns about the heat today are completely different. The yard is of no real matter, but the hoses are out watering the garden and trying to keep the vegetables producing. Water hoses then get drug out to the ten blue spruce tree's that were planted four weeks before the rain stopped and the heat began. Bigger issues yet are on the crops. Corn is spiking due to the extreme heat. It does this to protect itself and conserve the moisture it has in the leaves and stalk. We have to hope that it rains soon. Animals are outside enduring the temperatures. The dog will find a shady spot to hang out, and remains motionless most of the day. He tries to remain a guard dog, but all he really does is watch and oversee events until the temperatures drop in the evening. The barn cats tend to wander off and hide in the woods most of the day..... coolest place to be found!! Our chickens are most at risk of heat related complications, but I have been taking them fresh water often, with frozen bottles of water to help keep it cool as long as possible. The chickens "pant" to help keep themselves cool! Of course, panting is part of this guys daily life! It's nice to hear that there are local cooling shelters opening to help those who are not fortunate enough to have air conditioning. 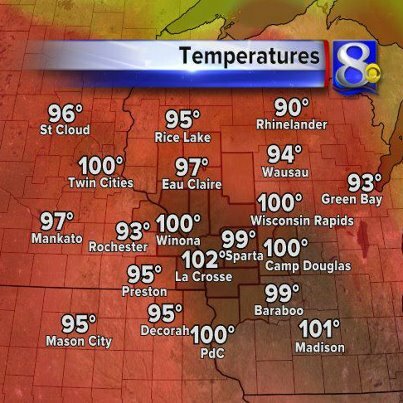 As of 3 pm on the 4th of July, we just broke a record set 101 years ago. I hope that everyone is playing it smart out there, staying safe, and staying hydrated! !